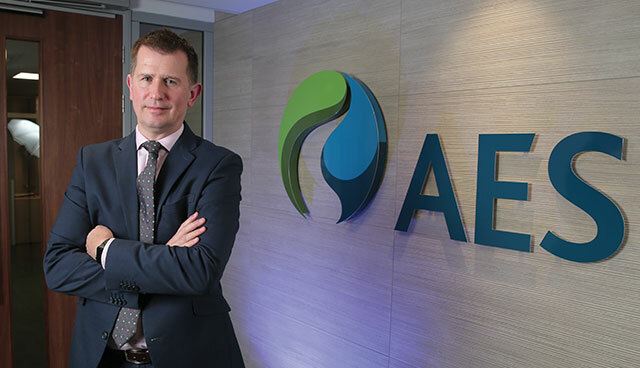 President of AES UK and Ireland, Ian Luney, discusses adapting to disruption of the global energy market, aiding the renewable transition and how challenges in Ireland are being met with new solutions. “A lot of people don’t know this but Northern Ireland was actually AES’s first foreign direct investment outside of the US in 1992,” highlights Luney, who took up the role in June 2017 having served as AES Europe’s Chief Commercial Officer. The American multi-national, active in five regions across the world, bought out its Belgian partner company in 2000 to take full control of the Kilroot power station and cemented its place as Northern Ireland’s largest electricity generator in 2010 by taking over Ballylumford. In 2016 the company generated 11 per cent of energy across the all-island electricity system, representing 61 per cent of dispatchable generation capacity in Northern Ireland. However, recent years have seen large drops in profits, owing to greater diversity in the energy market. This diversity, explains Luney, is made up of both local factors and those being recognised in energy markets on a global scale. Highlighting the universal challenges, he says: “We are seeing a transformative change in the downwards costs of renewable technology, particularly onshore wind, meaning renewables are now competing on a level-playing field with existing generation. “Disruption to the market is coming from several angles including greater customer empowerment and from smart grids and aggregated distribution that are now starting to make an impact spurred on by the advent of better technology. New players are coming to the market with a different mindset to the existing way of working and across the globe AES is embracing these innovations. Locally, he outlines that uncertainty around I-SEM and Brexit that are occupying the minds of the sector in Ireland. Luney explains that commodity price exposure, coupled with one-year only capacity markets and the ongoing restructuring of the ancillary services market arrangements (DS3) has been challenging. While greater competition in the market has its many advantages, Luney warns against creating an environment where security of supply is put at risk, at least in the short-medium term until the second North South Interconnector is operational. Historically the energy trilemma incorporated security of supply, cost to customers and decarbonisation. However, dramatically increased levels of customer empowerment in recent years is now not only an addition to the trilemma but many believe it is driving market behaviour. Increased customer choice has seen an increase in the volume of people going off grid with new innovative energy solutions such as smart metering and smart homes. It has also opened the door for the potential of large IT companies to enter into the energy sector. Luney believes that AES’s unique portfolio of fuel diversity in power generation is well placed to accommodate customer-driven demand. 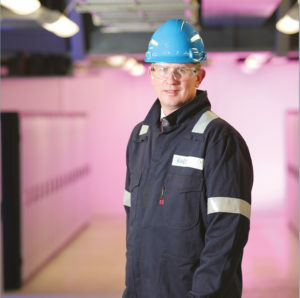 At Ballylumford the power provider operates a combined cycle gas turbine (CCGT), with renovated thermal gas-fired units acting in reserve to address any security of supply issues. At Kilroot AES operates duel-fired oil and coal units, the only coal-fired power station operating in Northern Ireland, and recently installed what was the UK’s largest battery energy storage facility (10MW) from January 2016 to July 2017. Across both sites the provider also operates a fleet of open cycle gas turbines (OCGT) with fast-start, fast-ramp capability. The market changes mean AES has had to think differently. 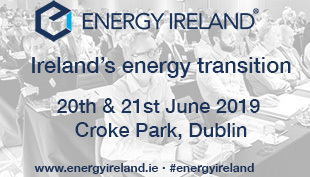 One of the ways in which it is achieving this in other global markets, and now integrating into the Irish market, is collaborating with transmission and distribution companies, “helping utilities and regulators think differently about how they invest in their asset base”. The two ageing power stations, in their current format, have a limited lifespan. At Kilroot, competitive pressures around carbon pricing and environmental legislation mean that it was always going to be unlikely that the station would be repowered in its current format. Uncertainty over I-SEM and Brexit also means that such large-scale investment would be risky. He explains that AES is not considering any diversion away from solely power generation and storage, instead the company are focussed on their strategy of transitioning the market before considering repowering either both or one of the sites with technology which is fit for purpose in the long-term, for a market which is dominated by renewables and interconnection. He admits that it is unlikely this will take the form of another CCGT, instead early indications suggest space for hybrid, fast-start, highly efficient peaking unit, with energy storage attached. “We are looking at things like this to as a means to try and create that sustainable energy market here in Ireland, where wind and solar could have a massive impact on how units are dispatched. Kilroot power station at Carrickfergus was sold to NIGEN, a joint venture between Tractabel of Belgium and AES Corporation from the USA in 1992. AES later bought out its Belgium partner and operates the 560MW dual coal/oil fired units plus 142MW of additional gas turbines at Kilroot. In 2010, AES purchased the largest power station on the island of Ireland, the 1,017MW natural gas fired station at Ballylumford, Islandmagee, County Antrim. In January 2016, AES Corporation’s first advanced battery-based energy storage facility in the UK was commissioned at Kilroot. The array provides 10MW of interconnected energy storage, equivalent to 20MW of flexible resource. Ian Luney is a Queen’s University Belfast graduate holding an Electrical Engineering degree and Master’s degree in Advanced Manufacturing, Design and Management. 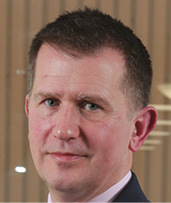 Before joining AES in 2009, he worked for both Viridian and Northern Ireland Electricity, latterly as Generation Portfolio Manager. 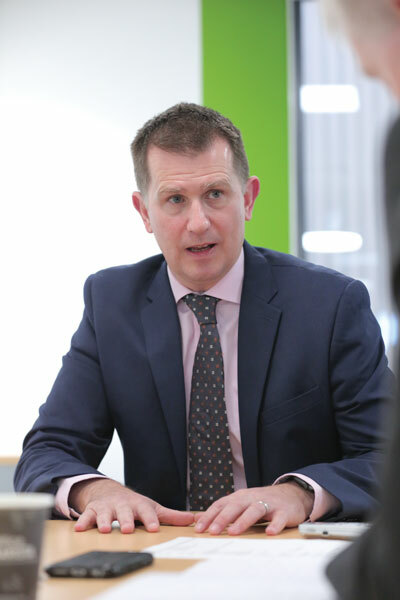 He has performed numerous roles within AES including Commercial Manager for Northern Ireland and Commercial Manager for Kilroot before being appointed Commercial Director for AES UK and Ireland. Before taking up his current role as President, Ian oversaw the company’s commercial strategy and operations across AES markets in Bulgaria, Jordan, Kazakhstan, the Netherlands and the UK and Ireland as Chief Commercial Officer for AES Europe. Outside of work, Belfast-born Ian says that he likes to get outdoors with his wife Sarah and three young daughters Alice (4), Grace (3) and eight month-old Anna, who keep him busy.